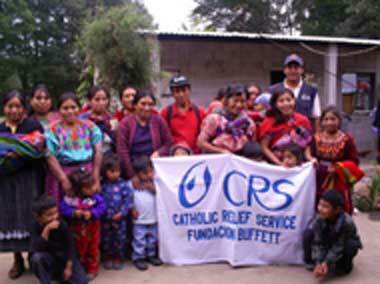 BALTIMORE: Catholic Relief Services (CRS), the official international humanitarian agency of the US Catholic community, is increasing its outreach to US Hispanics with a new Spanish-language Web site and Spanish-language PSAs promoting the organization's work worldwide. BALTIMORE: Catholic Relief Services (CRS), the official international humanitarian agency of the US Catholic community, is increasing its outreach to US Hispanics with a new Spanish-language Web site and Spanish-language PSAs promoting the organization's work worldwide. The new site, an extension of its English-language site that launched in 1999, launched on July 10, and includes information about where and what the organization does. With 39% of Catholics identifying as Hispanic, according to the US Conference of Catholic Bishops, the organization wanted to increase awareness of the work that it does, especially to those Hispanics who are more comfortable reading information in Spanish. CRS is working with Balsera Communications for media outreach, Directo Hispano for advertising, and Captura Group provided guidance for the new Web site. "With the Spanish-language site, we're looking at providing a vehicle for folks most comfortable reading in Spanish and giving them the opportunity to participate," said Lydia Dibos, the senior adviser for Hispanic outreach at CRS. "We want the subsequent phases of the Web site to have a lot more interactive materials and a lot more video clips. We're really adapting them so that they're appropriate in terms of a cultural aspect. Doing word-for-word translation isn't what you want to do for US Hispanics." Elsewhere online, the organization has posted its PSAs on YouTube, and has a presence on MySpace, Facebook, and Change.org. CRS also recently hired Sara Fajardo as an internal communications officer charged with improving communications with US Hispanic media, Dibos noted. "We really haven't had comprehensive strategy to better engage US Hispanics in the past and so we really did a lot of research and networking and talking to what other like-organizations are doing," Dibos said. "We put together this comprehensive strategy and it's just introducing people to our work." The next steps include increasing placement in national media, as well as developing radio spots and a targeted direct mail campaigns for US Hispanic in both English and Spanish.